When Bridgeport High School senior Emily Riggs heads to Fairmont State University next year to compete as a student-athlete for the Falcon’s women’s basketball program, she’ll be bringing plenty of honors from her high school days with her. Today, she got the biggest honor of the year. Riggs, previously named the Big 10 Player of the Year, was recognized by the West Virginia Sports Writers Association on the all-state team released today. Riggs was chosen to the first team in a vote by members of the WVSWA that also included ballots from the state’s coaches. Riggs was one of three players from Harrison County to land a spot and the only player on the first team. Lincoln sophomores Victoria Sturm and Hannah Ferris also made the cut. Sturm was named to the second team and Ferris was a third team selection after the Cougars once again made a trip to the Class AA state tournament in Charleston where, like the Tribe, they were toppled in the first round. The honor for Riggs doesn’t come as a surprise to those who watched her this season. The standout helped lead BHS to a 17-9 season. 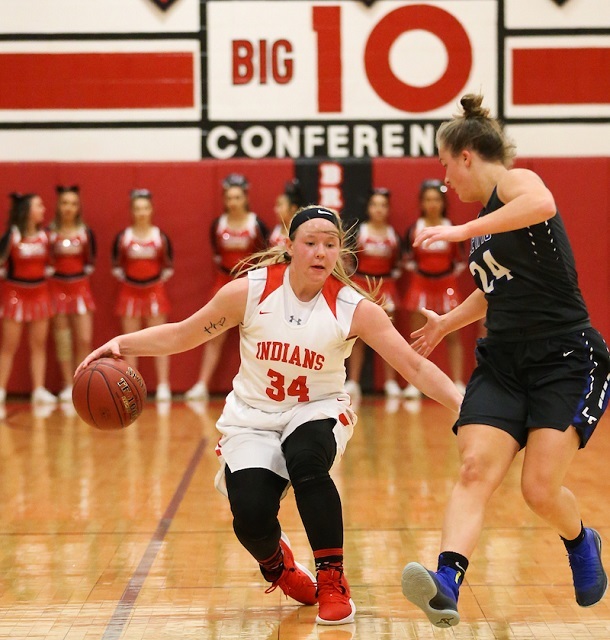 Riggs was a large part of that as she led the team with nearly 20 points per game despite continually seeing defense specifically aimed at stopping her. Coach Dennis Hutson, who stepped down following the team’s state tournament appearance, feels the honor is more than deserved. Hutson said he thinks Riggs will contribute and make a difference with the Falcons. Hutson also had praise for his two honorable mention selections.